U.S. Army Pvt. 2nd Class Jeff Frizzell, cannoneer, and U.S. Army Sgt. Robert Sullivan, gunner, conduct a proficiency drill demonstration with fellow members of the A-3/321 Field Artillery Regiment Wednesday at Forward Operating Base Salerno. 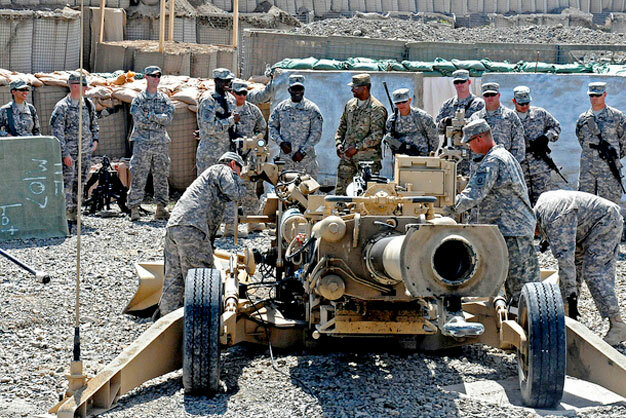 The soldiers performed the drill with a M777A2 howitzer while being observed by U.S. Army Command Sgt. Maj. Marvin Hill, senior enlisted leader, International Security Assistance Force/U.S. Forces-Afghanistan. Photo via US Army.